Lady Liberty and the bald eagle are two enduring symbols of American power and freedom. The bald eagle has been the national emblem since 1792, while the Statue of Liberty has stood in New York Harbor for over 130 years. Today, you can celebrate these American icons with the purchase of a 2015 1 oz Silver American Eagle coin from Silver.com. 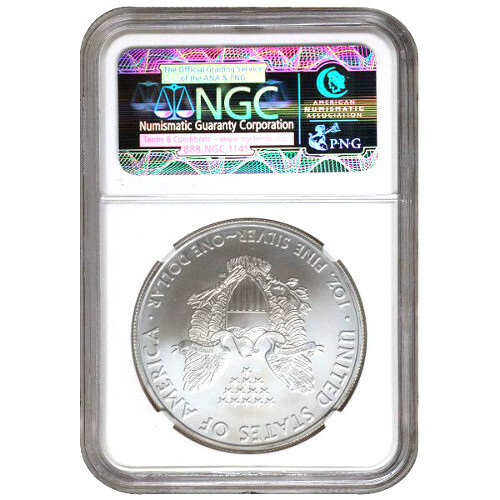 These coins are available with an MS70 grade from the Numismatic Guaranty Corporation, and are part of the Early Release series. 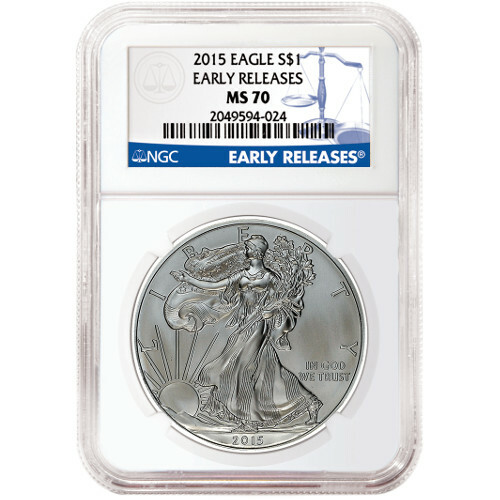 Early Release coins are those which arrive at NGC from the mint within the first 30 days of their release. Ships in an NGC slab. Graded a perfect MS70 by the NGC. Congress passed the Liberty Coin Act in 1985, paving the way for production of the Silver American Eagle as the nation’s official silver bullion coin. The bill authorized the US Mint and Department of Treasury to use silver stores from the Defense National Stockpile to produce Silver American Eagle coins. Adolph A. Weinman’s Walking Liberty design, first used on the Walking Liberty Half Dollar from 1916 to 1947, is featured on one side of these coins. John Mercanti, the US Mint’s chief engraver, designed the heraldic eagle on the opposite side. 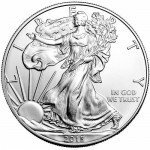 On the obverse side of the 2015 1 oz Silver American Eagle coin is Weinman’s image of Lady Liberty. She can be seen emerging from a rising sun on the coin’s surface. Engravings on this side include “Liberty,” “In God We Trust,” and the year of minting. If you have questions about these Silver American Eagle Coins or our online purchasing process, simply call our associates at 888-989-7223. You may also chat with us online using our live chat feature. We look forward to answering all of your questions and invite you to browse through our entire collection of Silver American Eagles for more grades and variations of these coins.